THE construction of vessels used for coastal services differs radically according to local requirements. The coasters working on the Australian coast, where a great deal of freight is picked up from lighters in open roadsteads and in rivers, are designed to carry the biggest load in the smallest space. The composite drawing below is intended to illustrate the smaller types of ships running on the Australian seaboards and rivers. Such a vessel is known technically as a raised quarter-decker. She has a small forecastle and a long well deck, with a hatch nearly 50 feet long and 14 feet wide. Abaft this is the superstructure proper, at the forward end of which is a large insulated space for the carriage of butter and dairy products. These must naturally be kept fresh by refrigeration. Abaft the insulated space is the engine casing for the main diesel engine - all such ships are now motor ships - with accommodation alongside. 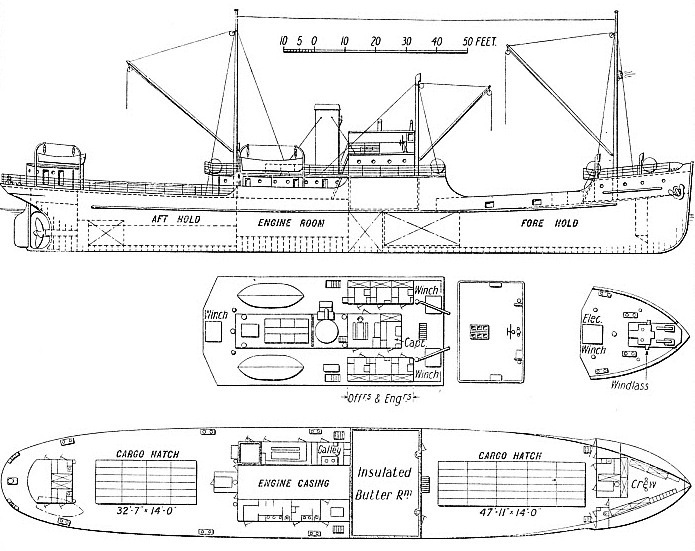 The raised quarter deck is then clear to the after end of the ship, with the exception of another large hatch. There is a small steering gear house aft, on which a dinghy is housed in davits. Accommodation for captain and officers is at the forward end. Winches are arranged on the boat deck so as to be clear of the hatches during loading. The winches are electrically operated and capable of handling loads up to five tons. Note the length of the derricks on the foremast and mainmast. The navigating bridge is a wide open structure with a glazed forefront. A ship of this kind has a deadweight tonnage of about 950 and a gross tonnage of 1,080. She has an overall length of 215 feet, a beam of 36 ft 6 in, and a depth of 8 ft 1 in. A heavy oil engine, with six cylinders 19.7 in. diameter and 35.43 in. stroke, gives her a speed of about 12 knots when loaded down to 12 ft 8½ in draught. Her horse-power is 1,100, at a propeller speed of 155 revolutions to the minute. A total electric load of about 132 kW is required for operating all the auxiliary machinery. You can read more on “Fruit-Carrying Ships”, “The Klipparen” and “Refrigerated Ships” on this website.